Identity Politics: Family sues to let daughter play on boys’ basketball team - shorter article - Infowars.com. Should I have a hearty chuckle, or should I shake my head in confusion, apathy, and indifference? Many would say, what difference does it make, who cares. Why not have a team pick the best players, regardless of gender? 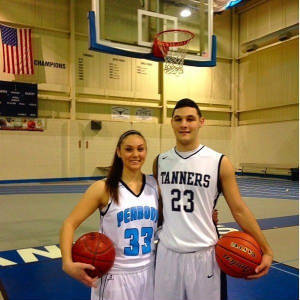 From a longer, original, article, (Why family is making a full-court press to get daughter on boys basketball team) Read more. OR, I should say, our churches have so lost their moral understanding that we should have this situation occur. I actually DO CARE concerning the entire issue -- see my site - GodIsAStraightMale.com. If some asked, "Do we have women in our military?" I firmly believe God would say, "There are females in the military, but NO women!" Regular military duty is NOT an aspect of womanhood, as far as God is concerned. Neither is competitive sports an aspect of womanhood, as God sees it. It does not jibe at all with the "meek and quite spirits" that God finds lovely in a woman. 1Peter 3:4 But let it be the hidden man of the heart, in that which is not corruptible, even the ornament of a meek and quiet spirit, which is in the sight of God of great price. Crazily, many Christians have embraced the ungodly behavior and indoctrination so popular today. New Testament Passage, 1 Peter 3 describes womanly behavior and adormnent God finds prescious. I explain at my page: Extreme Molecular Intricacy of Living Things Makes a Slam Dunk God Deliberately Made Us Heterosexual. I prove at my site - GodIsAStraightMale.com, that God, is in actual fact a spirit WITH a spirit body, and he is, in fact, an actual male being - and he is straight, (hetero), in his very nature. He made Adam, and men, subsequently, in his IMAGE -- He made Eve, and women, subsequently, TO BE COMPLEMENTARY KINDS OF HUMANS - WHAT A STRAIGHT MALE WOULD WANT. Men and women are to directly portray and actualize God in his straight male personage. I'm shocked and sorry to say that, there is a dirty, little secret in much of the clergy. (Big secret, really). When many pastors or bible teachers speak of the Trinity - God the Father, Son, and Holy Spirit, they understand these as OFFICES, of Father, and Son, NOT as actual genders. They ARE ACTUAL GENDERS, and correctly understood that way by genuine bible believer. This is flat out heresy and blasphemy, and the practice is kept secret, and it is wide-spread among clergy.